Aras an Uachtaran, in the Phoenix Park is where the President of Ireland, currently Dr Michael D. Higgins, from Galway, will reside with his family for the next seven years following his inauguration in Dublin Castle in 2011. 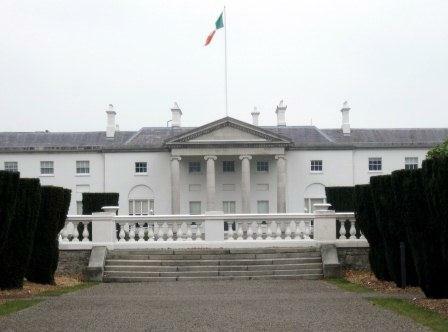 Not many people know, that you can actually visit Áras an Úachtarán yourself on saturdays, unless it is being used for official state business, which also means tours can be cancelled at short notice. And while admission is free, tickets are limited to about 100 and these are allocated on a first come, first served basis, from the Phoenix Park Visitor Centre close by at Ashtown Castle. Visitors are then transferred by private coach and given a guided tour of the state rooms and a short history of the building itself, that used to be the Vice Regal Lodge when it was occupied by the then governing body of England's various Lord Lieutenants, one of which, the Duke of Marlborough, was Sir Winston Churchill’s father. 1 Pheonix Park Visitor Centre tells you all about the park which is the largest enclosed park (1752 acres) in Europe. 3 Dublin Zoo the oldest in Europe established in 1831, which is constantly being revamped to meet modern standards and practices in animal management and welfare and a firm favourite of generations of Dubliners. 4 The Furry Glen where some 450 deer roam, also the Wellington Monument and the Pope's Cross all very familiar landmarks to Dubliners. 5 Victorian Tearooms (beside the Zoo) overlooking the bandstand (free concerts in the summer) in 'The Hollow’ with a nice children's playground. 6 The People’s Garden a park within the park and a homage to the Victorian style of planting with lots of formal bedding arrangements, old fashioned and very charming. 7 Polo and Cricket grounds (we are big into cricket with our recent victory over England) can be watched during the summer months. 8 Farmleigh House another official building used for entertaining visiting dignitaries and royalty which you can tour for most days for free, nice boat house cafe, garden and gallery. 9 Hire Bicycles at the Park Gates and follow any of the 15kms of safe cycle ways / family / nature trails within the Park. 10 The War Memorial Gardens at Islandbridge, just outside the Park, across the River Liffey is dedicated to the 50,000 Irish soldiers who lost their lives in the great war.